A few weeks ago my family and I went to Kentucky to visit with more family. While we were there we stopped at The Ark Encounter. 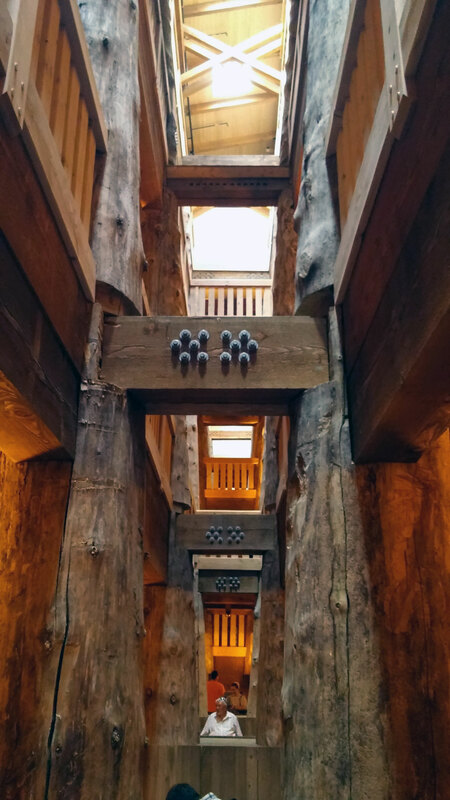 For those of you that don’t know what The Ark Encounter is, it’s a full-sized replica of Noah’s Ark built by creationist Ken Hamm and his organization AnswersinGenesis.org. I’m assuming it was built in Kentucky due to its proximity to the Creation Museum only an hour away. To give you a little back story on my views towards the building of an ark, I was not for it. This project cost millions of dollars which could have been used for other types of ministry instead of building an ark! So when I found out that on our trip we were going to visit this massive money pit I was a bit skeptical. Since I was spending time with my family and we were doing something together, I put my apprehension out of my mind and went with it. We took the Ark exit and drove a-ways to a massive parking lot. There were a lot of church buses and charter buses. From my experience I would say most of the ark’s visitors come in groups. From the parking lot you could see the massive wooden structure. I’ve been on cruise ships and spent a lot of time at Cedar Point. So when it comes to large boats or amusement parks I’m pretty hard to impress. 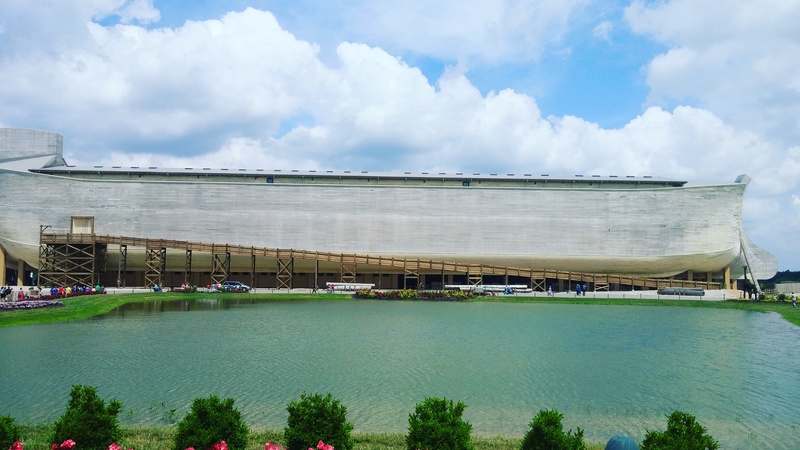 The parking lot is a mile away from the ark and you could still see how immense this boat is. I was impressed. We got our tickets and our wrist bands. Then we stood in line and waited for a bus to take us to the ark. On the bus we listened to Ken Hamm welcome us to the ark and try to up-sell us tickets to the creation museum. We were dropped off in front of the ark where there was a view are where you could take pictures. This thing was so immense it was hard to get the entire ark in the pictures we took! After our picture-taking we went through the metal maze of rails to get into the ark. There weren’t a lot of people there in the morning so we breezed through and entered the first floor. The first floor when you enter is full of cages of different sizes and large clay urns. You are in the stern of the ark. You can see the massive timbers used to build the structure. Animal noises come out of the wicker cages to make it seem more authentic. The further you go into the ark you hear the sound of thunder rumbling. All those sounds together give you an eerie feeling. The sounds combined with the massiveness of the structure made the experience intimidating. Before you get to the second floor there is a display of Noah and his family praying. Honestly the display didn’t do anything for me. Maybe if they were animatronics they would have blended in more with the visual and audible experience of the first floor. To me it just seemed out-of-place. The second floor is dedicated to the plausibility of the ark. 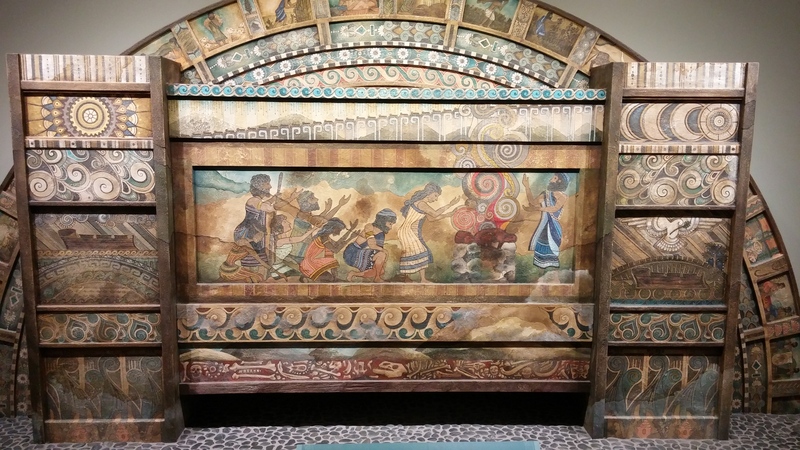 This entails a tour through the pre-flood world (their interpretation of it), exhibits detailing Noah’s family and how they could have maintained the ark and cared for thousands of animals during the flood. 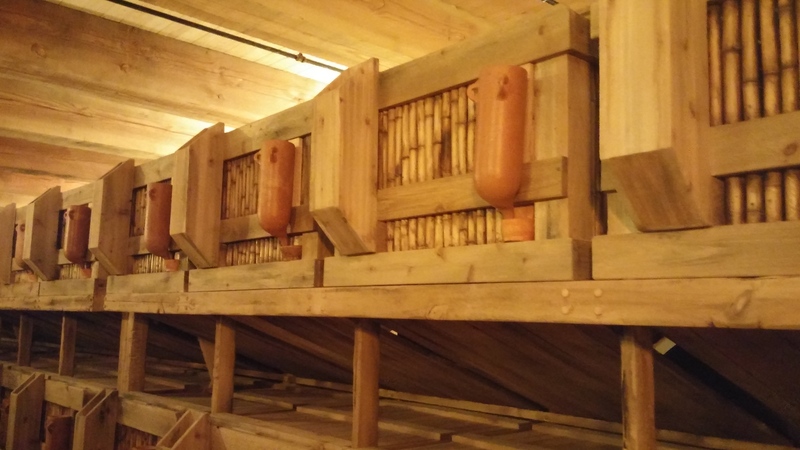 Exhibits included living quarters, types of trade needed to build the ark and to build a society after the flood, and more cages. The cages were larger and you could see the animals inside. At first you see a lot of mammals which one would expect in a zoo. 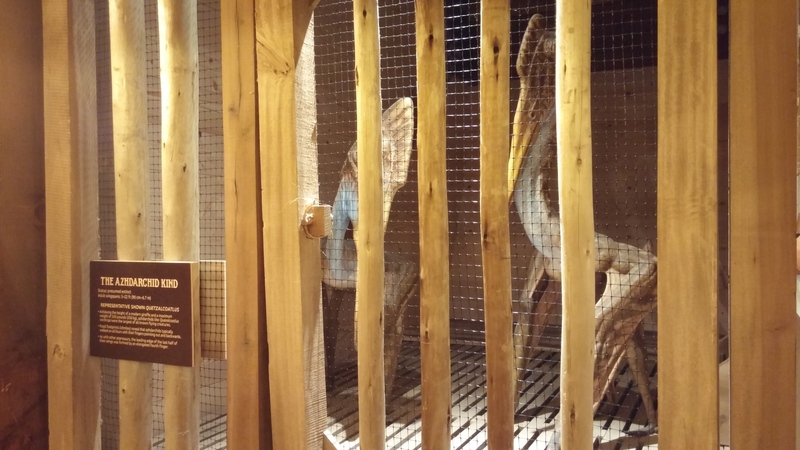 Then you come across some Triceratops in a cage next to other sauropods. I will say it was kind of strange to see. Pterodactyl’s next to elk? Yeah. Creation vs. Naturalism note: Creationists do not believe that every animal was taken on to the ark. Only an animals “kind.” For example, there were no poodles on the ark. But there was a canine kind. The variations in canines and other animals after the flood are caused by evolution. In other words, the creationist believes that a dog can evolve into another variant of a dog. But the dog cannot evolve into a giraffe. I’m generalizing but you get the point. At the stern of the second floor is a 30 minute movie called The Noah Interview. It’s a cute film where a pre-flood TMZ interviews Noah for their show. It answers a number of questions about the ark, the flood, Noah and his family. The film doesn’t take itself seriously which makes it fun and informative. The third floor details life after the flood. You can check out Noah and his family’s living quarters and then go on to discover the impact the flood had on our world. To me this was the most fascinating part of the ark and the most convincing aspect of the flood story. The ark museum does a fantastic job with their exhibits laying the case for the creationist point of view. It’s hard not to walk away without wrestling with the evidence that at some point in the earth’s history there was a catastrophic event that changed the landscape of the entire planet. 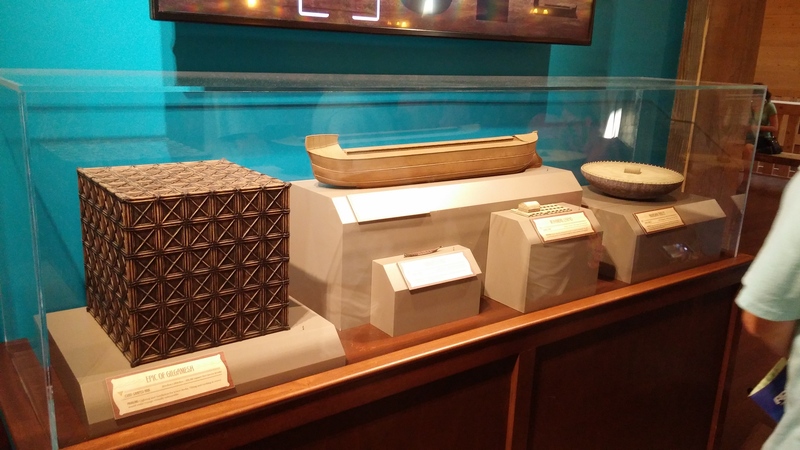 Instead of attributing the evidence of this event and it’s impact on humanity to “aliens”, the ark museum makes a plausible case for the flood. The other half of the third floor is a mini bible museum. You can walk through a brief history of the bible and it’s translations. There is one more thirty minute video you can watch. This video takes place in modern times and it’s a TMZ-like magazine interviewing someone from the The Ark Encounter. This video explains why The Ark Encounter is important in light of the gospel. Why the ark story is important and relevant to our salvation. God shut the door and the rains came down. From the bow of the third floor we walked down to the first floor bow section where the gift shop is. I bought a t-shirt at an affordable price I might add. My family and I took a break and ate at the restaurant next to the ark. I wasn’t impressed. Probably need to work on that part of the park. We did walk around the petting zoo. There are plans to expand zoo part of the park. I saw potential and look forward to going back when it’s larger. There were also zip lines. No clue why. We spent six hours in just the ark. That’s how large and interesting The Ark Encounter is. The people who work at the ark are friendly and helpful. The ark itself is amazing. Everything else, Ken Hamm might want to consult Disney on how to improve. 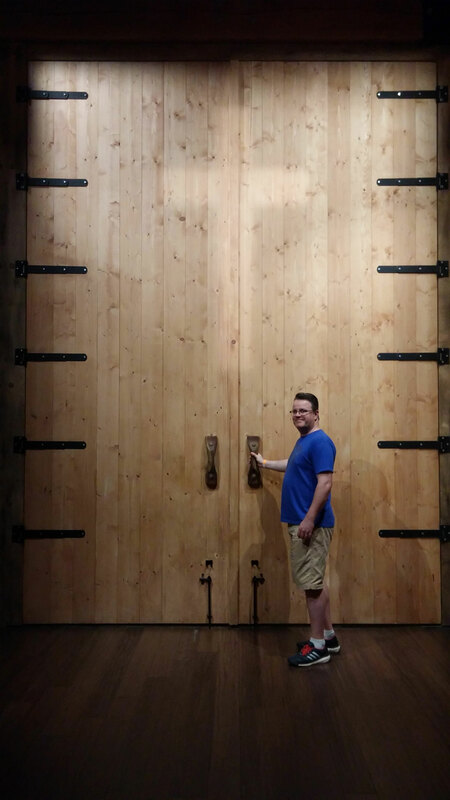 I recommend a visit to The Ark Encounter for believer and skeptic alike. It was a fantastic experience that increased my faith and challenged my assumptions.